Join us in celebrating National Poetry Month this April! Special Collections is pleased to sponsor a poetry reading by Nikky Finney, April 26. 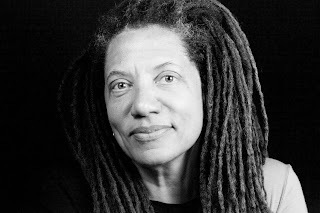 Finney has authored four books of poetry: Head Off & Split (2011); The World Is Round (2003); Rice (1995); and On Wings Made of Gauze (1985). Professor of English and creative writing at the University of Kentucky, Finney also authored Heartwood (1997), edited The Ringing Ear: Black Poets Lean South (2007), and co-founded the Affrilachian Poets. Finney’s fourth book of poetry, Head Off & Split was awarded the 2011 National Book Award for poetry. The reading will take place in the Special Collections Library, in the Great Hall of the King Building, with a reception to follow. 4-6 pm. Free and open to the public. Please RSVP to kate.hesseldenz@uky.edu or 859-257-1742.